David Bowie The Rise and Fall of Ziggy Stardust and the Spiders from Mars (often shortened to Ziggy Stardust) is the fifth studio album by English musician David Bowie, which is loosely based on a story of a fictional rock star named Ziggy Stardust. It peaked at No. 5 in the United Kingdom and No. 75 in the United States on the Billboard Music Charts. The album tells the story of Bowie’s alter-ego Ziggy Stardust, a rock star who acts as a messenger for extraterrestrial beings. Bowie created Ziggy Stardust while in New York City promoting Hunky Dory and performed as him on a tour of the United Kingdom, Japan and North America. One of rock’s seminal albums and polled as one of the Greatest Albums Of All Time in Rolling Stone, NME, Melody Maker and on VH-1, David Bowie’s ‘The Rise And Fall Of Ziggy Stardust and The Spiders From Mars’, celebrates its 30th Anniversary on June 6th 2002 . To mark the occasion, on July 8th, EMI re-release the album with an additional 12 track disc. This deluxe 2CD collectors’ package will be presented in book format with a 36-page booklet, including new sleeve notes by David Buckley (author of Strange Fascination and The Complete Guide To The Music Of David Bowie), a time-line, briefly tracing the recording history of the album by Kevin Cann and previously unseen photographs by Mick Rock. 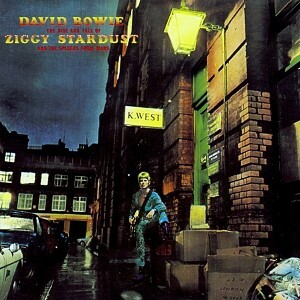 The original album will feature on CD1, whilst CD2 comprises of 12 tracks associated with the Ziggy album including a previously unreleased mix of ‘Moonage Daydream’ which originally featured in the Dunlop tyre TV and cinema advertisement campaign in 1998 and some previously unheard dialogue which can be heard before the intro. to ‘Sweet Head’. The album was highly acclaimed when it was originally released in 1972, giving Bowie a Top 10 album, keeping it in the album charts for a staggering 106 weeks – just over 2 years! A must for Bowie fans world-wide. David Bowie is also marking the 30th anniversary with his first book, Moonage Daydream – The Life And Times Of Ziggy Stardust, a 340-page limited edition history of Ziggy, featuring a 15,000-word text by Bowie and 600+ photographs by Mick Rock, published July. 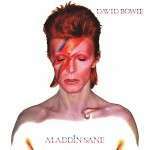 Each of the 2,500 numbered copies is signed by David Bowie and Mick Rock, and quarter-bound in blue leather. Yahoo UK have a special tribute web-page (http://uk.music.yahoo.com/ziggy/index.htm) dedicated to the 30th anniversary Ziggy Stardust 2CD including streaming videos of the “John I’m Only Dancing” and “Space Oddity” videos and full-length audio tracks of “Moonage Daydream” and “Suffragette City”. 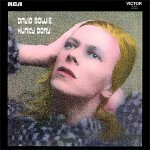 Also included are seven Ziggy Stardust photographs by Mick Rock. It sounds like a cliché, but to an entire generation this album has become a yardstick by which to measure all others. Why the hyperbole? Because the strength of Ziggy lies in its completeness. Not a track is out of place, in fact not a NOTE is out of place, and at just over 38 minutes it is (and this has been scientifically proven, boys and girls) the perfect length. Every R&B and Hip Hop artist in the universe take note. So, does it still stand up after 30 years? Is it a major strand in rock’s rich tapestry, with its gender bending bravado and melodramatic sweep; or just an ephemeral piece of fluff about a bisexual pop star living through the apocalyptic countdown? With its so-called classic status written in stone, a perverse logic makes you want to reassess the album in a negative light. It can’t be as good as all that can it? But remember, there’s a reason why all those bands have dined out on this sonic template (step forward Suede, Supergrass and countless others). Within two short years Bowie had transformed himself from fey folk wannabe into a glam icon, via a brief flirtation with heavy metal. In doing this, lest we forget, he forged the template for the truly modern pop star that has yet to be broken. How this was achieved had a lot to do with two factors. One was his adoption of three lads from Hull as his backing band, renaming them the Spiders From Mars and thus making the wild Les Paul stylings of guitarist Mick Ronson an essential element of his sound. The second was young Davids choice of producer. Most people associate Tony Visconti (the man who gave Bolan his glam sheen and who had played on and produced the aforementioned metal album The Man Who Sold The World) with this period. It was, in fact, with his previous album Hunky Dory that DB found the perfect studio partner for this phase in his mercurial career. The pairing of Bowie with Ken Scott at Trident Studios allowed him to finally nail a simple format of guitar, bass, drums and piano into the place where the New York nihilism of the Velvet Underground met a quintessentially English way with a tune and a vocal. Ziggy represents the peak of their achievement. Having perfected the format Bowie took his greatest leap forward by taking a cycle of songs and moulding it into a loose story of the nominal Ziggy and his Christ-like rise and fall at the hands of adoring fans. It allowed Bowie to take the central role onstage, hiding behind a mask of glamorous decadence that some would say he’s yet to renounce. The songs weren’t bad either. The part sci fi, part demi-monde narrative unfolds via the sophisticated use of shifting perspectives, beginning with “Five Years” and its tale of despairing humanity at the brink of destruction. Ziggy is observed through the eyes of one besotted fan who, following the star’s death, takes their own life in the thrilling climax of “Rock ‘n’ Roll Suicide”. From piano-led sumptuousness (“Lady Stardust”) to plain old dirty riffage (“Suffragette City”) Dave was on a creative roll that would catapult him to the heights of success but ultimately lead him to destroy the Frankenstein’s monster that had him and his audience confusing fantasy and reality. 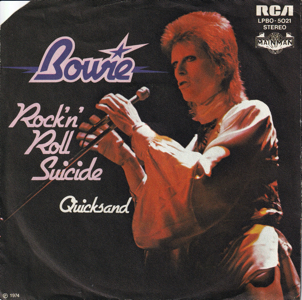 So here it is, with the obligatory second disc featuring early versions by fake band Arnold Corns, demos, outtakes that most bands would kill to have as prime material (including “Velvet Goldmine”: yes, the film was named after it), b-sides and one of Bowies greatest singles, “John I’m Only Dancing”. It’s a worthy treatment of such an aural treasure and one can only hope that generations to come will come to love it as much as their peers. Ultimately, what Ziggy really represents is an artist who was in the right place, with the right people and the right songs at the right time. The future held plenty more surprises; but for millions this will always be the place where the world’s most famous Martian truly fell to earth. If anyone qualifies as rock royalty these days, it’s David Bowie. So it’s only fitting that EMI gives Bowie’s glam-rock breakthrough album Ziggy Stardust the royal treatment in this 30th anniversary reissue. Besides the superbly remastered version of the album — which contains a cornucopia of classics including Five Years, Starman, It Ain’t Easy, Hang on to Yourself, Suffragette City, Moonage Daydream and, of course, the title track — you get 40 pages of liner notes and photos, all bound in a mini-hardcover book any Bowie-phile will find irresistible. Less essential, however, is a second CD of demos, old singles and leftovers that didn’t make the original LP. It’s not that these cuts are inferior; Velvet Goldmine, Holy Holy, Amsterdam and The Supermen are classic Bowie cuts. But most, if not all of them, have already trickled out on various compilations over the years, devaluing them from a collector’s point of view. Still, it’s hard to complain about this set, which easily qualifies as the ultimate version of a bona fide rock classic. The Rise and Fall of Ziggy Stardust and the Spiders from Mars is widely considered to be one of the most accomplished rock albums of all time and occupied the Billboard U.K. chart for a whopping 106 weeks. In commemoration of the David Bowie masterpiece’s 30th anniversary, Virgin revitalizes the album for a July 16 release (July 8 in the U.K.). The first disc of the new two-CD set plays the classic album in its entirety: “Five Years,” “Soul Love,” “Moonage Daydream,” “Starman,” “It Ain’t Easy,” “Lady Stardust,” “Star,” “Hang Onto Yourself,” “Ziggy Stardust,” “Suffragette City” and “Rock ’N’ Roll Suicide.” While Rykodisc also reserviced the CD with bonus tracks in 1990, this edition includes those extras plus more: an entire second disc of added material, featuring unheard versions of “Moonage Daydream” and “Sweet Head,” plus new remastering and artwork.